This page will tell you how to use partition software to redistribute hard disk without formatting on Windows Server 2012. Download IM-Magic Partition Resizer Server to to shrink or extend disk partition on Windows Server 2012 without formatting the hard disk. When installing a hard disk on computer, you may divide it into several partitions. When partition a hard disk, you need to format it in order to make it available for data storage. Then, do you need to reformat hard disk when you need to resize disk space? Now, with help of IM-Magic Partition Resizer Server, a professional partition tool, you are able to resize hard disk without reformatting disk. This partition software enables you to move free space from a partition that has extra free space to the partition that is lacking of free space. This partition software is compatible with all Windows Servers. You need to move the unallocated space close to the partition that runs on low disk space. 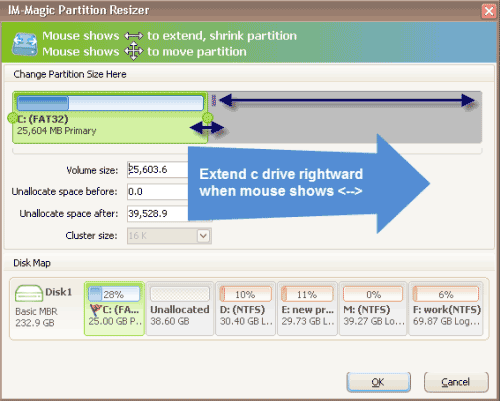 Then, right click the partition and select "Resize/Move" option. Move the arrows to increase the size of selected partition and then click "Apply" button. "I want to reallocate some free space to C drive on Windows Server 2012. Do I need to repartition and reformat hard disk in order to reallocate some free space? 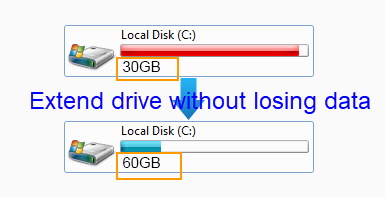 I am wondering if there is any easy way to increase the size of C drive without formatting hard disk. Can you give me some advice?" "Can I resize hard disk without formatting on Windows Server 2012? I want to resize hard disk because I frequently receive low disk space warning message on system partition recently. I think it will be useful to fix the low disk space problem if I can increase the size of system partition by partition resizing, but I do not think that it is a good way to format the partition because it contains lots of important data. So I want to look for a partition tool to resize hard disk without formatting." If you are looking for a solution for partition resizing without formatting, you can use the partition software IM-Magic Partition Resizer Server. You have no need to repartition or reformat hard disk by using this software, so it is not necessary backup data before partition resizing. This partition software enables you to reallocate disk space with all original information untouched. You just need to drag the mouse and perform a few mouse clicks so that you can resize hard disk and reallocate disk space effectively and efficiently. Many people doubt whether they need to reinstall operating system in order to expand size of system partition because they are afraid that it has any influence on the system due to partition resizing. As a matter of fact, the partition software does not affect the operating system when help resize hard disk. Therefore, you do not need to reinstall system to resize disk space. This partition software is available for all Windows Server users, so it can be fully compatible with Windows Server 2012 when you want to reallocate disk space for system partition or data partition. Windows Server 2012 R2 has some improvements based on Windows Server 2012, so it has a better performance. If you meet low disk space problem on Windows Server 2012 R2, can you resize the hard disk with help of the partition software? The answer is yes! IM-Magic Partition Resizer Server is also able to work on Windows Server 2012 R2 to reallocate disk space. You can use this partition software to resize FAT32 partition or NTFS partition on Windows Server 2012 R2 without rebooting your computer. This partition software allows you to accomplish partition resizing effectively and efficiently. What if the computer reboots due to other reasons during partition resizing? For example, will it have any influence if the computer switches off due to power failure during partition resizing, what will happen? If you meet the similar problem in the partition resizing process, you do not need to worry because the partition software will not cause any hurt to system or disk data.